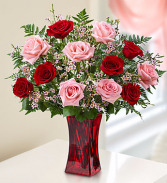 Nothing pairs as sweetly as radiant red and charming pink roses! 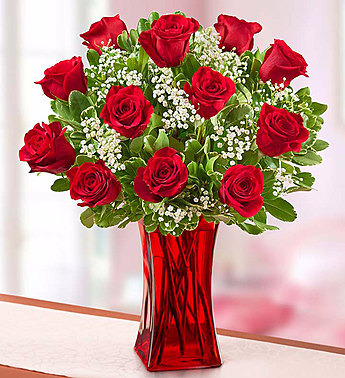 We’ve gathered them together with lush vibrant greenery in an elegant red glass vase, creating a timeless surprise for someone very special. Picked fresh from the farm to enchant your special recipient with its blushing pink blooms, the Dreamland Pink Mixed Flower Bouquet is the perfect way to bring a touch of the unexpected into their everyday. 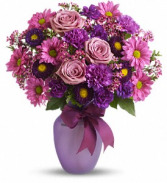 Hand gathered in select floral farms and blossoming with the sweetest shades of pink, this stunning flower arrangement has been picked fresh for you to send in honor of a birthday, anniversary, the birth of a new baby girl, or as a way to extend your heartfelt thanks and gratitude. 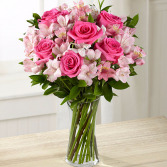 This bouquet includes the following: pink roses, pink Peruvian Lilies, and an assortment of lush greens. Available with a wide variety of vases to suit your every gifting need.